To most, I’m sure the Yhrosian Empire is cherished and treasured. Probably. But even if it is, the world of Ethenia is still in trouble, and… well, those guys are to blame. Entirely. No excuses. They’re 100% responsible. This is where Light Apprentice/would-be hero Nate comes into the picture, here to – hopefully – save the day, in this odd blend of comic, gamebook and turn-based RPG. An odd, yet undeniably intriguing blend. As for exactly what happens is, from the moment this particular story begins, up to the player, plenty of choice-and-consequence awaiting within. “Fight or flee”? Ugh. So old-fashioned and tired. Nah, how about “fight or befriend” instead? Yeah. 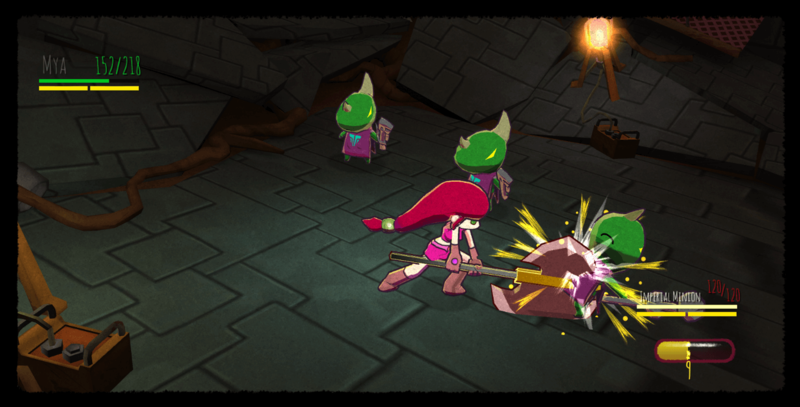 Turn monsters into allies on your quest for epic loo– I mean, to save Ethenia. That said, will you let greed dictate your actions, an unquenchable thirst for power, or actually use the skills at your disposal to play the part of a textbook hero? Only one way to find out: pick up Light Apprentice and prepare for a journey of… comic book… proportions? Right. You know what I mean! Light Apprentice [Early Access until November 10, 2017] is available from Steam, carrying a $9.99 price tag.